Promotion your product with iPAD magazine can appeal more people attention, especially iPAD fans. To launch the mobile marketing, you should use Flash Magazine Software for iPAD, to convert PDF into iPAD magazine with real leaf effect. iPAD magazine created by Flash Magazine Software for iPAD, enables you to turn the book page to read, just like a real paper book. And it is compatible with HTML5. When you output it with HTML and Mobile version, people will easy to view it on iPAD, iPhone, Android tablet. The best way to attract mobile users and launch mobile marketing! It is not enough to share your magazine on website. As we all know, each people has a social circle. If we promote our magazine in their social circle, we can imagine that more readers will be added with a limit time. 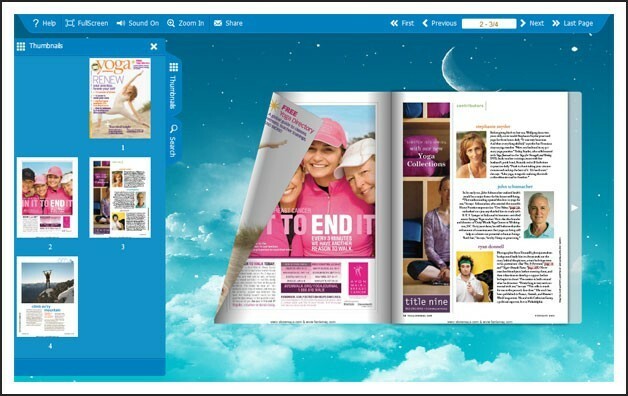 So, Page Flip Software for iPAD provides the feature of "share" and "social share", for people easy to share the magazine via e-mail and social network. With using Flash Magazine Software for iPAD, you will obtain many kinds of templates, helps you to make text book, catalogue, publication, magazine, business card, flip photo album etc. And every template also provides various themes, with pre-designed background and toolbar color. Even you do not like the static background, it doesn't matter, and you can apply 3D scenes in software to make your magazine more vivid and living. If the imported PDF have many pages, people will hard to find their wanted page quickly. Well, you should use this page flip software to do some settings, for people reading easily. Enable show Thumbnail and edit the list of book title while designing, after applying change, you can easy to find your interested page in bookmark or thumbnail panel.